Club RunWenatchee’s Tina Wagner holds up her “10-Run Shirt” that she received after completing 10 of the weekly club runs. When: Every Thursday year-round (with the exception of holidays), check in is anytime between 4 and 6 p.m.
Where: Check-in is inside the south entrance to Pybus Public Market, 7 N. Worthen St., in Wenatchee. Distance: Either a 5K (3.1 miles) or 10K (6.2 miles) on the Apple Capital Loop Trail. You can run or walk these distances. That’s up to you! 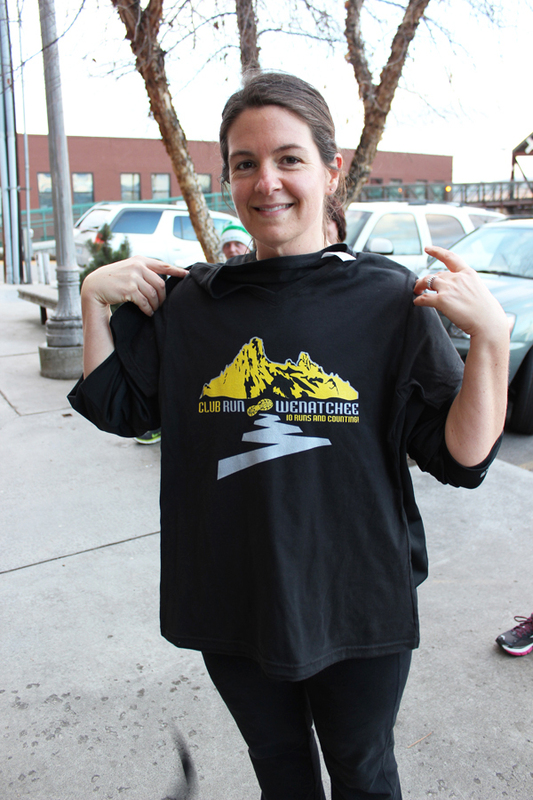 Run club shirts: Complete 10 of these weekly runs or walks and you will receive a free — and really cool — shirt noting your accomplishment! The same after you hit the 25, 50, 100, 150, 200, 250, etc., marks.